The Handrail Support, part 136, was introduced in the May 1922 Meccano Magazine, and four of them were supplied in outfits 6 and 7 from 1924. The sister part 136a, Handrail Coupling, took ten more years. 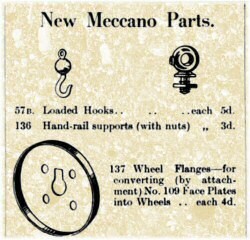 In the January 1932 Meccano Magazine, a J. Hamilton of Belfast suggested a new form of Handrail Support "manufactured with a boss drilled to take a standard Axle Rod in place of the threaded projection", and this suggestion was well received by Meccano. 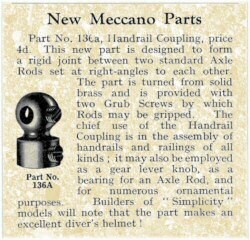 The Handrail Coupling was first mentioned in the September 1932 Meccano Magazine, but wasn't added to the existing or the new lettered outfits of 1934. One finally made its appearance in the new 1937 outfit 10, increased to 2 with the wartime reintroduction. As a result, these parts are less common than the Handrail Support and it is quite rare to find pre-war parts. The Handrail Support was originally single-tapped, and became double-tapped in the late 1920s along with other parts. The Handrail Coupling, on the other hand, is only found double-tapped as it made its first appearance in 1932. The only slight change I've seen is that the very late Meccano France Handrail Couplings appear to have a larger boss than earlier UK-manufactured parts. It's only a matter of a millimetre or less, but is fairly obvious when you view a pair together. 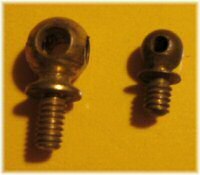 Pre-war parts are stamped (with MFEA or later just Meccano), either around the base or over the top of the parts. Post-war parts aren't stamped at all. Interestingly, my examples of French production post-Binns Road are stamped, the only brassware I can find that is. The photo to the right shows a pre-war (stamped), post-war (unstamped), and French Handrail Support. You can see from the picture above that the French Handrail Coupling is stamped around the base. One more oddity is shown right. Clive Weston reminds us that there exists a very small part looking very much like a handrail support, that often turns up at the bottom of Meccano collections. This is in fact from the boiler of a Hornby train. Just so you know what it is when you find one! DMS/EMP isolate a different version of the Handrail Support (but not the Handrail Coupling) with a "flat top". I can't see any recognisable sequence or order to this. There are certainly some Handrail Supports and Handrail Couplings with rounder and flatter tops, but they appear to me to be spread evenly around the chronology of the system and are more likely due to manufacturing tolerances rather than any specific change in design. 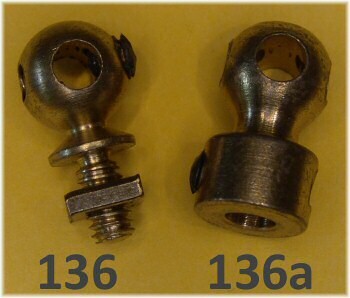 For example: the early, mid, and late Handrail Supports shown above right have identical tops; yet the middle and late Handrail Couplings shown in the picture above them have obviously different tops. But I'm ready to listen if you know different! 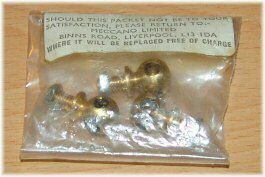 The image to the left shows a late 1950s spare parts box containing three Handrail Couplings, part 136a. As these are brass, the boxes stay the same right through to the silver/yellow/black period. 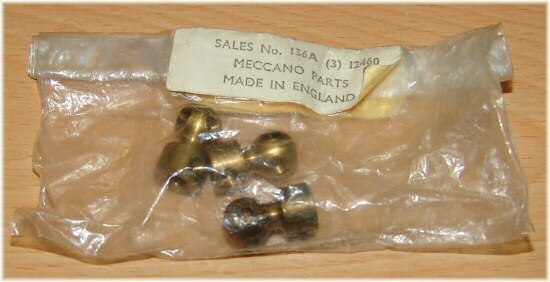 To the right, a bag of Handrail Couplings (even though the label incorrectly describes them as part 136), believed to be from the last period of UK Meccano spare parts in 1981. To the right we have a slightly earlier pack of three Handrail Supports part 136, dating from the late 1970s. 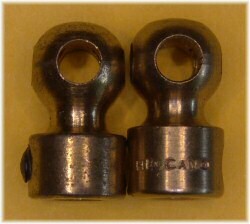 Note the incongruous hexagonal zinc plated nuts helping us date these. 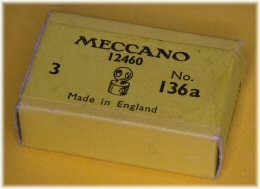 Below, a similarly dated bag of three part 136a. I have a Handrail Coupling with the drilling not in the heat but in the base. Is this a commen mistake? I guess the picture hase been flipped horizontally before adding the P/No captions. Charles will surely fix that sometime because I don't think Meccano used left hand threads. I know there are some replica worms with L/H threads. Maybe just a triviality, but main photo shows Number 136 with Left Hand Thread.